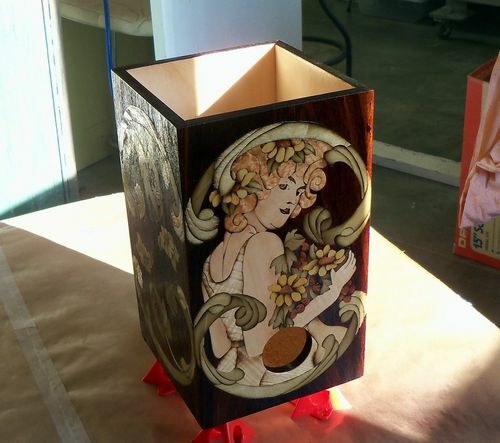 Well at long last I greet you all with the last blog on this Marquetry Wine Box Saga!! Keeping my 93 year old father company (these past two day) while he recovers from a nasty lung infection, has given me ample opportunity to catch up on computer stuff. And now I can devote a few relaxing hours to the composition of this final blog! Well it’s time to put a lid on this whole thing and cap her up in fine style! 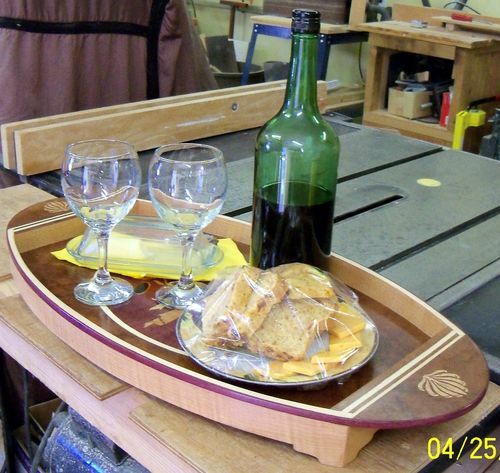 The only part I’m cheating on here is the use of a previously made lid base … left over from my Old Wine Box days! It was the perfect size, but definitely needed beefing up and beautifying. I cut a piece of Cedar plank (given to me from Paul’s stash and which he so kindly planed to my requirements for another wine box I intend to create.) Ah yes! A future blog!! 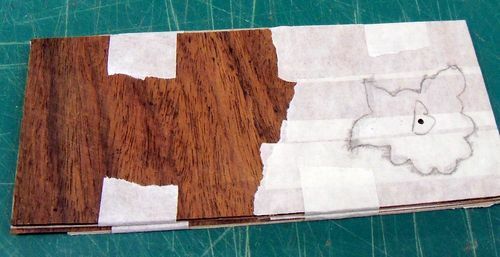 This piece of Cedar will attach to the bottom part of the lid base … and because my (indelible ink) signature exists on the underside of my OWBox lid, I had a sudden spurt of inspiration deciding to incorporate my ‘John Henry’ in this style. What’s with the red wine in a bottle?! Well it’s all about ‘presentation’, and it’s just very unfortunate that my home-made cheesy onion bread and cheese plate, etc. 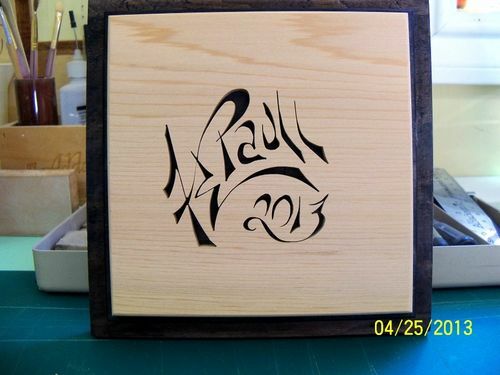 has all but obliterated a vision of Paul’s beautiful Marquetry design on this very special gift he offered months back … feeling that he was ‘short-changing’ me on our arrangement of veneer/cedar planking exchange. If he doesn’t come into my ‘veneer-candy-store-room’ more often, I’m afraid he’ll want this beautiful tray back!! Nah … not Paul. He’s such a sweet guy!! Feeling the glow of wine infuse my grey matter … the most I could concentrate upon (after Paul left) was to throw a few loose thoughts together. What do I want the lid to look like? Certainly not plain and simple like the poor OWBox lid. I want pizazz!!! And that’s about as far as my thoughts would go for that day! It is amazing how the mind takes over at times when you least expect it. In the middle of that night I awoke, knowing my dreams had been playing around with lid-thoughts. My eyes opened, and ideas flooded straight through them into my brain. I’m sure I’m not alone with that miracle feeling of inspiration that makes you want to leap from the bed … or stop the car to jot down the idea before it’s lost!! I couldn’t wait to get back in the shop the next morning. However a few days passed before I was able to formulate that mind-thought. In the meantime another visit from Paul took me back to the workshop for a brief but enjoyable moment while we discussed some possible veneer choices to depict water for his most recent project. Even though days past, my mind remained actively involved with ideas that finally came together with my next workshop day. Exploring with NGR stains to portray a Rosewood look onto solid stock Cedar seemed to work just fine … and so I cut more Cedar for the top of the lid, having one particular reason for this in mind. I didn’t have solid stock Rosewood! 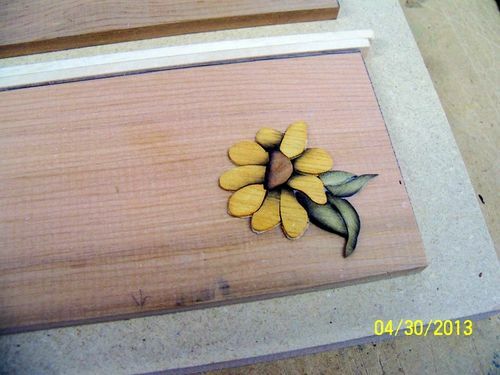 And I needed solid wood to carry out my idea of ‘inlaying’ the Marquetry flower with Intarsia formation. Something I have never done before … or even thought to do! 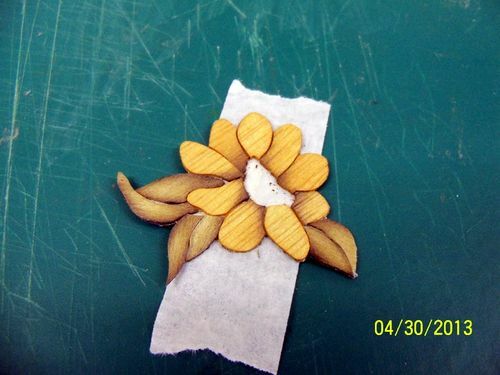 The flower center was glued onto the cut stock piece after being filled. The flower petals and leaves were cut out individually, leaving a template for me to scribe onto the other section of lid. 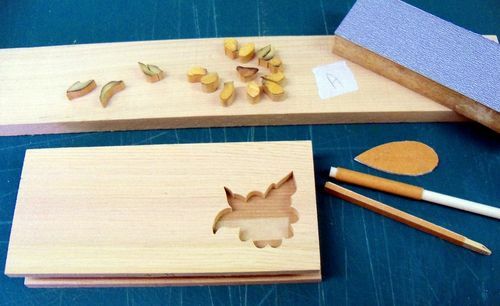 All these parts were sanded and shaped … by hand because they were way too small for tooling! I like!! 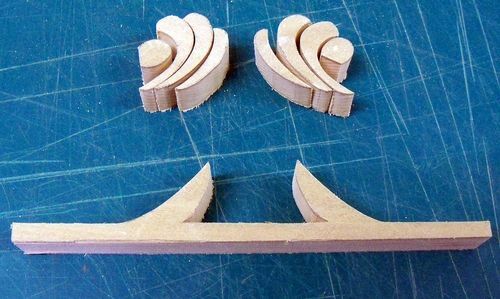 But decided against elevation of various parts as the veneered surface bumped the design just enough. 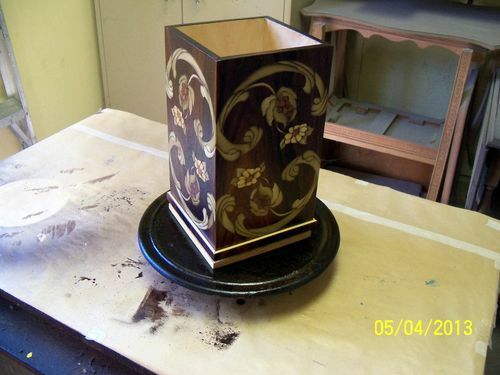 NGR stain was applied to both pieces that would comprise the lid. Walking away from the workshop that afternoon, I was happy with the results so far. ......... then sanded to shape. When it came to sand shading the edges, butterflies fluttered … never having done this kind of shading before. I had to use my specialized piano tweezers in order to grip that thickness over the heat … a bit hot to handle but it worked!! 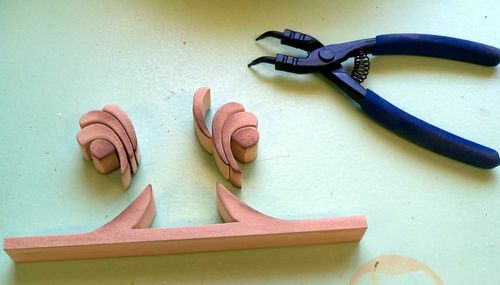 Then they were set in order for staining, and lacquering … before assembling what will become a free standing Intarsia handle!! In the meantime … I had qualms about the ‘Rosewood’ Cedar … it didn’t look just right. I kick myself for not thinking of this right off the bat … but you know what they say about hindsight! The surface was sanded completely free of NGR stain … don’t ask me why I did that because I didn’t need to. I guess my mind was in a quandary over my next step, and so I needed extra time to ponder! Maybe that’s why it takes so long for me to get things done!!! I decided to veneer over the Cedar with Rosewood. Duh! ... why didn’t I think of that before now?!! But before I could do that I had to do a ‘rub’ of the recess area in the cedar. 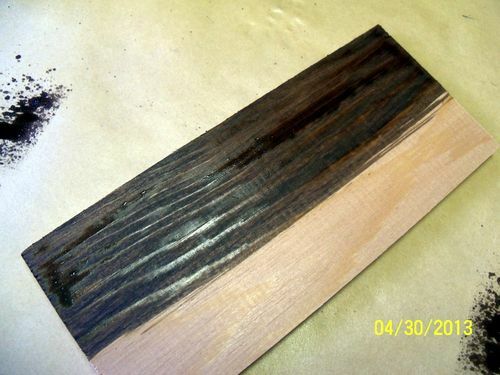 Both Rosewood sections were padded together, and cut along the inside of the penciled rub. Inside … because you want a tiny bit of excess to trim off, instead of the cut being too large. The handy-dandy Dremel will clean things up! 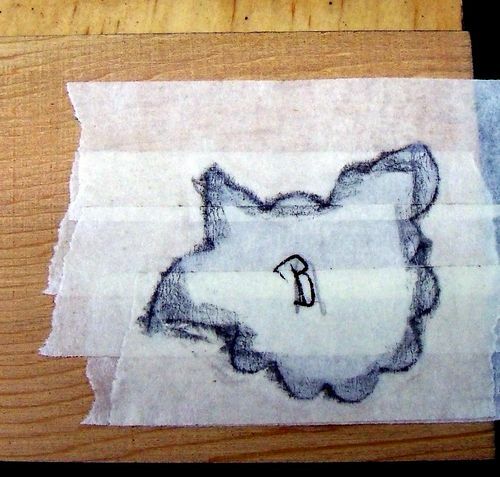 And because I’ve now applied a layer of veneer over my solid stock portions of the lid-to-be, effectively eliminating the elevation of my Marquetry Intarsia-ed flower, that section cut from the Rosewood is glued into the recess … elevation solved!! I can read your minds … OMG!! what is happening now?!! Yes, those are paint stir-sticks from Cloverdale. Perfect for my little dream-inspired notion! 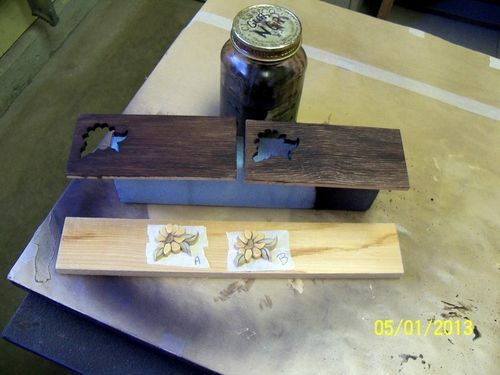 Rosewood glued onto sticks … then sticks separated … sanded …. 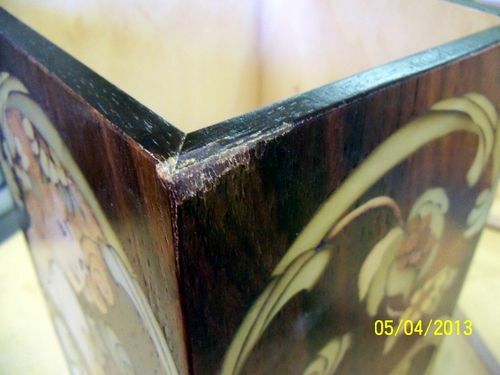 .............. these miter-cornered trim pieces were glued in place around the semi-finished lid … before the insertion of flowers, etc. so I had a flat surface to work with. 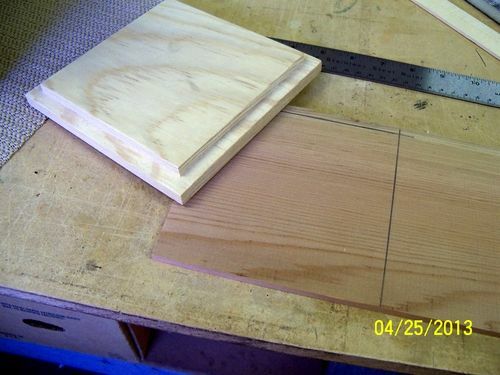 Strangely enough I didn’t take photos of the miter-cutting process which was done on my bandsaw table set at the most ungainly angle!! 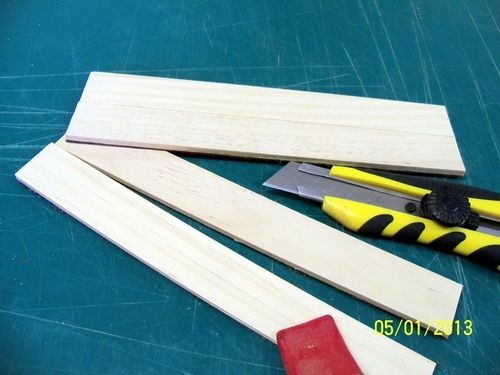 My mind was on the horrendous task of concentration … mitered corners!!! See them pretty mitered corners!!! The stir-sticks give the accent I had in mind! ... and now the lid is ready for a few coats of lacquer sanding sealer with recesses protected. 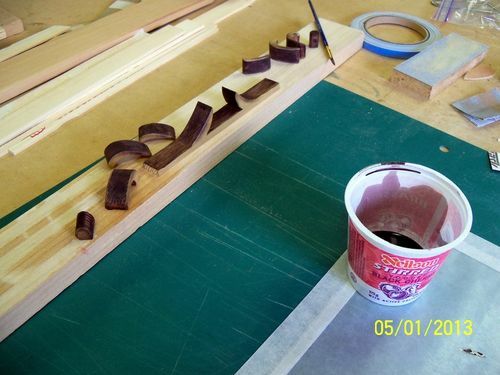 Actually at this stage, the top has already been given a few coats … before the trim was applied. The surface shows up much lighter in this photo than it really is. 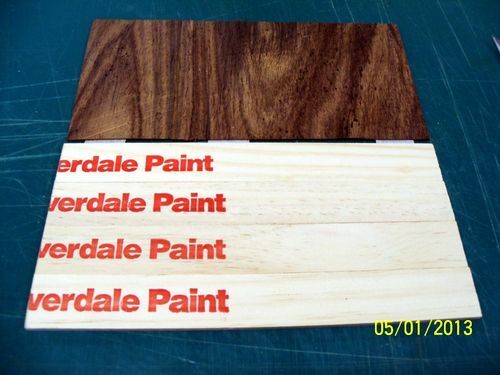 I was so impressed with myself, I made more ‘Rosewood sticks’. Stick around and you’ll see how they were used!! OH NOOOOOOOOOO!! 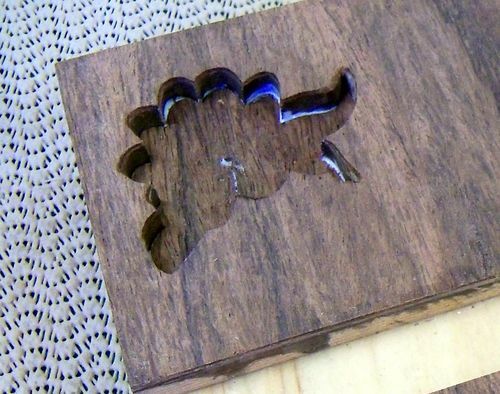 In my hast to spray one more coat of sealer onto the box so I could stop for lunch, my precious article of excessive hours slid off the spray table and landed with a crash while I had turned to pick up the spray gun. I froze … afraid to look!! So much for being impressed with myself. Puff up those feathers, and something bad is bound to happen! It’s either that … or my stomach was protesting over lack of regularly scheduled nutrition!! Have I ever mentioned those special spirits I have in my workshop? ... watching over my every move?? Well … somebody up there loves me, because the damage (although to the upper front corner) was easy to fix! One smart smack, a bit of glue … and a dab of touch-up pen was a very quick fix indeed. 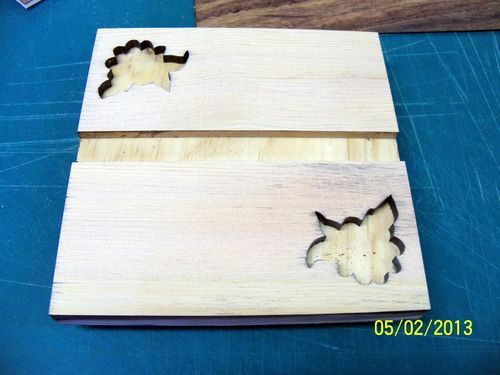 With only preliminary lacquering at this stage, the added coats will hide all signs of distress. Thank you my Workshop Spirits!! Hummmmm! ... You would think I could have at least shown the repaired injury!! I guess you’ll just have to trust me that nobody will ever notice the boo-boo … But did you happen to notice the Rosewood-stir-stick trim around the bottom of the box? I think that’s what I was trying to capture in this photo for you all to see!! 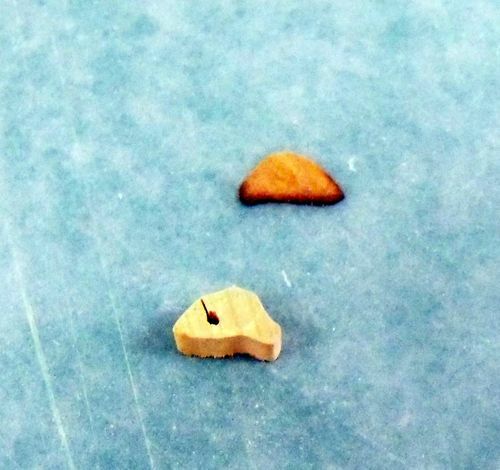 I also forgot to show the cork bottom on this box, to prevent scratching our countertop. 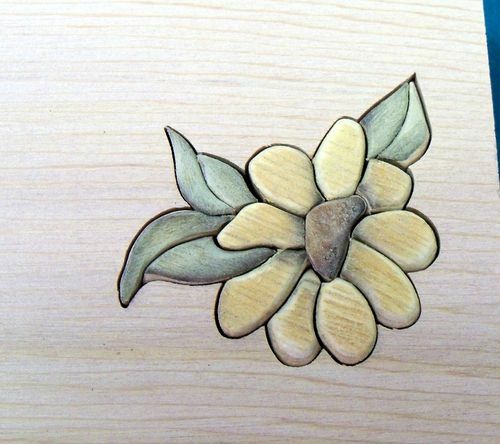 Well my LumberJock Buddies I’ve come to the end of this series of blogs on my Marquetry Wine Box Saga. I know … I know!! You’re screaming: ”What? Where’s the finished lid?? !” Even after enduring this very lengthy blog, you still want more?!! I’m always ending blogs with thanks … and this one is no exception!! AGAIN I thank you all for joining me from start to finish. It’s been a wonderful journey, made more so because of your involvement! Each time I pour myself a glass of wine from Nouveau Gal … I shall think of you all. Elaine, you are truly a creative genius sometimes. That is some nice lid!! Do the folks at Cloverdale Paint ask many questions when you just come in for stir sticks? Great project and wonderful blog. 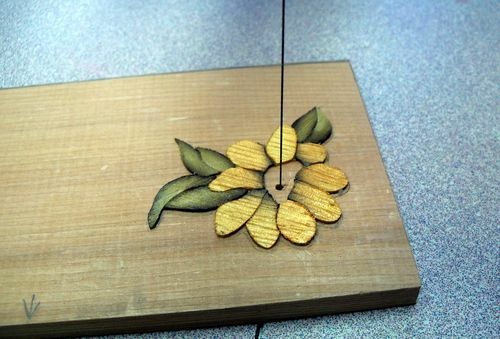 HI Elaine, thanks for a great blog, a glimpse into marquetry and for sharing your project build with us. 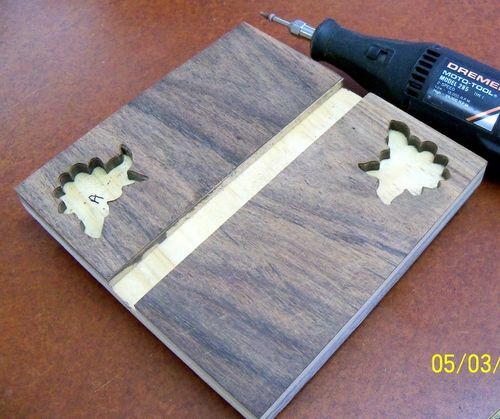 I look forward to seeing your posted project. Is Nouveau Gal base on an Alphonse Mucha picture? Thanks for the great blog, I learned and enjoyed it. However now I am addicted and your leaving us cold turkey. How about Nouveau Man, or boy, dog, something. Looking forward to your next project. Hi Elaine, what an amazing journey! An awesome project! 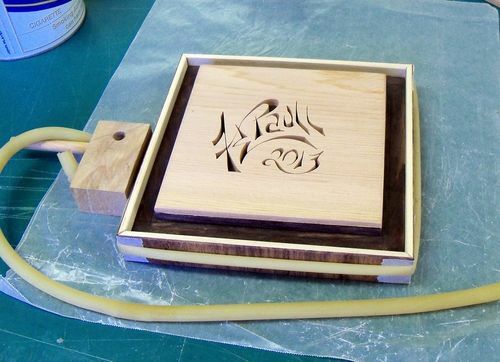 I’m looking forward to seeing the photos of the finished box lid and all on your project page. I love the way you have signed your piece. Great idea! Yes Peter … you are absolutely right! When I was searching for an Art Nouveau design, that’s all I googled and up popped a plethora of designs without any credits given … just the images. My thanks to you for his name which I immediately googled … and found my Nouveau Gal!! ... along with Alphonse Mocha’s many beautiful Art Nouveau paintings. Tom … actually I’ll soon start working upon Nouveau Lady for our granddaughter’s 13th birthday. That blog will be short and sweet as most of it was already blogged in the Wine Box Saga … but you’ll have to wait until the end of June for that blog to happen. Can you hold off that long?! Thanks Anna … glad you liked the signature. I thought it was pretty cool myself, and hope to carry the idea through to future pieces! OK most of the time. That was a wonderful ride Elaine. Full of excitements and pizazz. I Will be waiting for your project with anticipation; I got to see the lid:). Thank you for this great blog series. 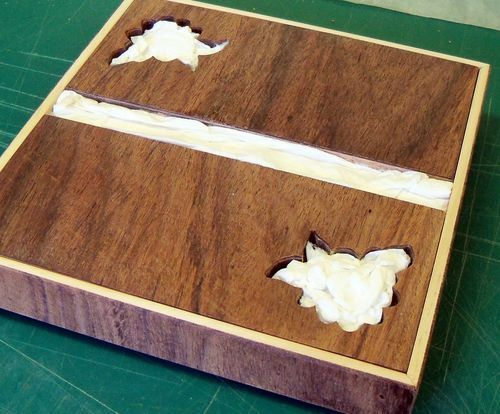 I’m really looking forward to your project post when you reveal the finished lid. And I’ll be sure to check for your blog in late June on your granddaughter’s birthday present. I hope your dad is soon fully recovered. We’ll be traveling to see my folks soon (94 and 95) and know how precious the time with parents can be. 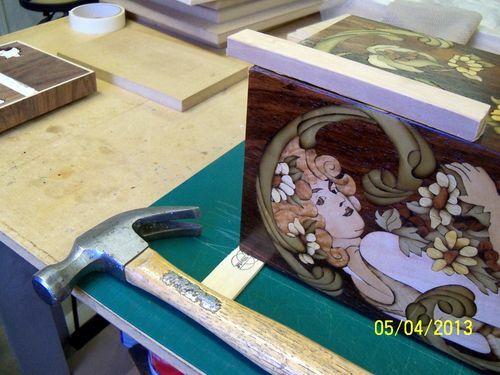 I very much enjoyed your witty, amusing blog on this beautiful wine box Elaine and I learned a lot too. I always read your blog at least three times. The first time for the fun of it. The second time to get my head around what you have actually done, and finally a third time to appreciate and understand the artistic choices you have made to give your work the wow factor! I also really love the signature you devised, very artistic and cool. I’m sure your father will be glad to get you back now, but we will surely miss you while you are away. Thanks for sharing with us. I felt for you and the box, but you carried on. Thank you again for just doing this! The project is certainly beautiful and following the progress is inspiring to each of us; your candid, honest blog is entertaining as well as educational. Its been a fun trip. I hope you take us along again. Best wishes to you and your family. Elaine, you do absolutely beautiful work and I loved the pictures and explanation of it all. I surely want to see more of what you do and how you do it. I’ve somehow missed seeing your work before, but I’m adding you to my buddies list, so that doesn’t happen again! Great series, and has left us like many of our TV shows do at spring time, wanting and waiting for more episodes!